Discussion in 'Networking and Wireless' started by voxish, Nov 6, 2009. I've recently installed an internal sierra MC8775 3G WWAN module in my Acer 3810T notebook. I used the supplied antenna which is a small approximately h-shaped piece of copper wire with a short pigtail connector. It connects OK but it reports a VERY weak signal - I'm on 3 network in the UK which connects fine with a reasonable signal using the same sim in a huawei 169 dongle. Is there a better 3G antenna I can use? There are several on eb*y for named machines (eg thinkpads and HPs) with longer leads connected to various terminals. I could probably fit one of these inside the Acer with a bit routeing experimentation but are these antennae agnostic when it comes to the laptop and embedded card it's attached to? Or are they totally specific to a particular machine? How many 3G antennas does your Acer have? If it has two, I would suggest not to change the antenna(s) but to swap the MC8775 card to MC8781 or MC8780 instead since MC8775 doesn't support diversity like the later two. The antennas are usually located in the best places, which are on both the side edges of the laptop's screen, and your laptop's manufacturer should have already installed the best ones fit into the design. So, changing 3G antennas might not make a big different, at least compared to using both antennas/diversity which is not possible if your laptop is using MC8775. Thanks for replying. I installed the sierra MC8775 myself (it's very easy, there's a mini-PCIE slot free just underneath the keyboard). Unfortunately there are no antenna wires pre-installed for 3G WWAN just for the wifi module. There is only one antenna socket on the MC8775, the one which was supplied is very weak so I need something with better gain. What I need to know is will any decent antenna do even though it isn't designed for my notebook (so long as I can fit it in and route it of course)? Where do you install the antenna? The best for signal reception is on the edges of the laptop's LCD. Usually, the WiFi antennas are on the top edge and the 3G antennas are on the left and right side edges. I'm familiar with MC8775's one antenna socket because I also have it although no longer use it. It used to be installed in my Dell Studio 17, but has been replaced with MC8781 which has more features. The good thing about my Dell is the antennas are preinstalled, so I just need to buy the 3G card and install it my self. I prefer MC8781 due to it uses 2 antennas for radio signal diversity, so it might give better signal reception. And it also has GPS capability, although I never use it since Studio 17 is a stay at home heavy weight laptop. I was asking where I could get a better antenna to replace the weak one I have. The consensus is to get one with a long wire but is it possible to use a spare wi-fi antenna instead of one intended for WWAN? If I can get away with one antenna and route it in the base of the machine, so long as it works satisfactorily I'm not bothered about perfection. I use wi-fi indoors but it's useful to have 3G on the train or when I'm out and about. Newbie question: By 'radio signal diversity' do you mean that if it loses contact on one antenna it picks up another station on the other? Or does it mean that both signals are added together improving the signal strength? GPS would be handy, had I realised that there are WWAN cards with that capability I'd have probably spent a bit more and got one LOL What software does the MC8781 use - is it like the sierra 'watcher' app? And does GPS just work or is specific software needed (not just eg Google Maps)? The reason that I asked is because antenna positioning is important. A friend of mine had tried to use MC8781 with antenna attached to it. Practically this antenna was positioned at the base of his laptop. He reported that the signal reception was not acceptable. 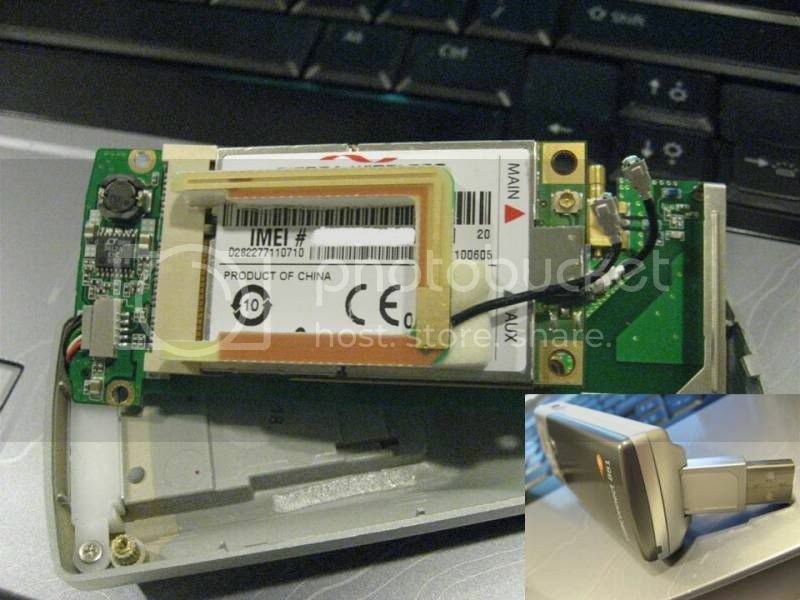 His MC8781 was actually a pulled-off card from USB 3G modem Sierra Wireless AirCard 881U, so it has its auxiliary antenna attached/glued on it. I got my MC8781 the same way, from the internal card of 881U. You can see the antenna in the picture below. It's now glued on MC8775 (you can identify it by its only 1 antenna connector), since the MC8781, where it's used to be glued on, is now installed inside my Dell Studio 17. I'm not a technician also, but AFAIK diversity in radio signal could mean both of your assumptions (CMIIW). 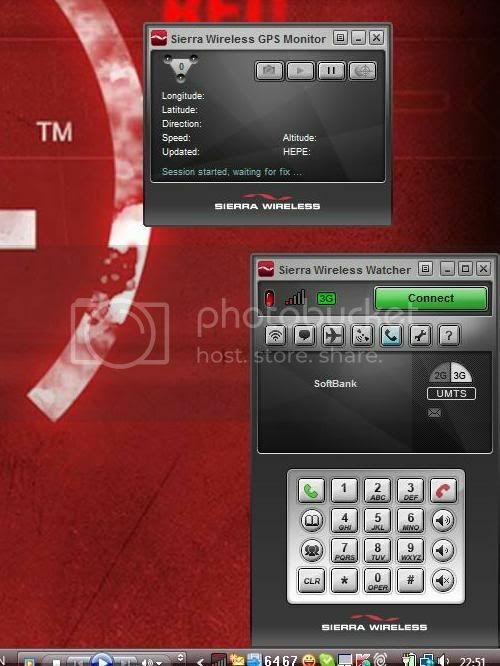 I only use Sierra Wireless Watcher that I downloaded from their website. Ahhh I see now - that's exactly the antenna I have except it sits under the keyboard. Could it be that the weak signal is because it's under the metal plate on which the keyboard sits? Then you better get the kind of antenna which can be installed on the laptop LCD frame (if that what it is in your first post), since this is the best place and where usually laptop manufacturers put the 3G antenna(s), then route the cable down to where your MC8775 is installed. I have went through a few types of antenna for my wwan card but nothing comes close to those antennas placed at corners of the LCD. In order to do that, some dismantling work will be needed but you will be able to enjoy very good reception. I had tried placing those U-shaped antenna under the keyboard and the reception was simply disastrous. That is my experience too. It works but only in strong signal areas and even then it's unreliable. I think it's because it's sandwiched between the motherboard and the aluminium keyboard plate. How to connect 2 antennas to Wwan DW 5808module with 3 connectors? How does WWAN options work on laptops?